April 9, 2013.- The average price for the first quarter of 2013 has dropped in some European markets on a year-on-year basis. 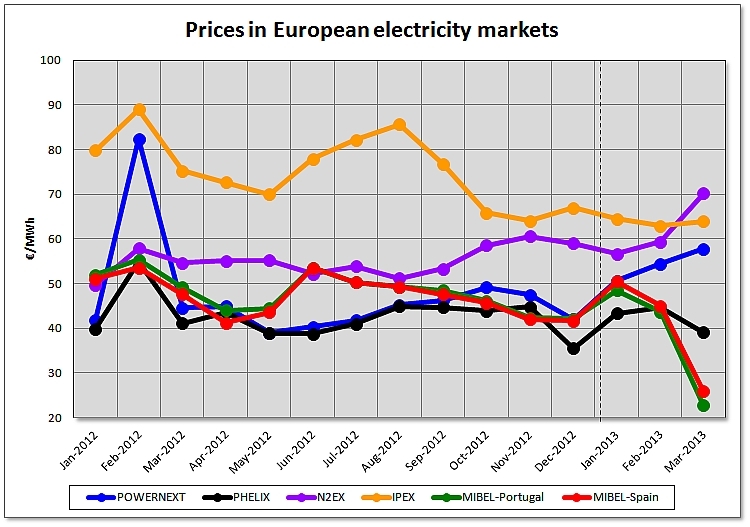 The high prices registered in February of last year as a result of the cold snap that hit Europe in that month is one of the factors that has caused this drop, although in some markets this was influenced by the decrease in electricity demand in conjunction with the increase in the generation of electricity using renewable energies. Only the N2EX market has experienced a rise in prices during this quarter, which was caused by the rise in prices of gas and the low temperatures registered in the United Kingdom for this period. Prices of the N2EX market are expressed in €/MWh and are calculated from original values in £/MWh. In the Spanish and Portuguese MIBELmarket, the drop in electricity demand together with an increase of special regime and hydroelectric production have caused considerable drops in the prices of this first quarter, even after the new electricity taxes came into force on January 1st, 2013. In Spain, the average price for this first quarter has been 40.33 €/MWh, which is 10.33 €/MWh lower than the average price for the same quarter of last year. In Portugal, the average price for the first quarter of 2013 has been 38.17 €/MWh, which is 13.89 €/MWh lower than the average price for the same quarter of last year. The largest price drop took place in March of this year, in which the average price fell to 25.89 €/MWh in Spain and 22.79 €/MWh in Portugal as a result of the market price remaining at 0 in many of the hours (24.6% of the hours in Spain and 25% of the hours in Portugal). In the FrenchPOWERNEXTmarket, the prices for the first quarter of this year dropped 1.47 €/MWh on a year-on-year basis, registering 54.28 €/MWh. 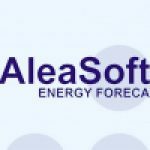 However, when analysing the prices on a month-on-month basis -except February, when the prices dropped 27.99 €/MWh as a result of the cold snap rocketing prices in February of 2012, the prices in January and March have risen with respect to the same months of the past year, with an 8.75 €/MWh increase in January and a 13.12 €/MWh increase in March. In the GermanPHELIXmarket, the average price for the first quarter of this year has been 42.27 €/MWh, which is 2.84 €/MWh lower than the average price recorded for the same quarter in 2012. This drop can be explained partly as a result of the high prices registered in February of 2012 -the average price registered for February of this year is 10.31 €/MWh lower than February of last year. A 3.42 €/MWh growth on a year-on-year basis was registered in January, and in March prices dropped to 2.03 €/MWh. With regard to the main markets in Western Europe, the BritishN2EXwas the only market in which the average price for the past quarter increased by 8.36 £/MWh (8.18 €/MWh) reaching 53.43 £/MWh (62.19 €/MWh). This rise is due to the increase in electricity demand in the United Kingdom, caused by low temperatures, and also due to the price rise of gas. In the ItalianIPEXmarket, the average price for the first quarter of 2013 has been 63.84 €/MWh, that is, 17.39 €/MWh lower than the average price registered in the same quarter of last year. This drop, in addition to being influenced by the high prices reached during the cold snap experienced in February 2012, is associated with a decrease in electricity demand. The following table shows the price forecasted by Aleasoft for the main European markets in the second, third and fourth quarters of 2013. The following table shows the growth in the price forecasted for each quarter with respect to the same quarter of the past year. The average price of theBrentbarrel for the first quarter of 2013 has been $ 112.49, which is $ 5.93 lower than the average price in the first quarter of 2012. In February, the price of the Brent barrel increased to $ 116.09, but in March the prices returned to the values in which this fuel has been moving around in the last months, reaching an average price of 108.81 $/barrel in this month. The average price ofZeebruggeandNBPgas for the first quarter of 2013 has reached 28.36 €/MWh and 25.33 £/MWh, respectively, which represents a year-on-year increase of 5.31 €/MWh for Zeebrugge gas and 5.26 £/MWh for NBP gas. The price ofCIF-ARAEuropean coal has continued its bearish trend, and the average price for the last quarter has been 86.76 $/ton, which is 27.88 $/ton less than the first quarter of 2012. For the rest of 2013, the price of the Brent barrel is expected to remain stable around 110 $/barrel. 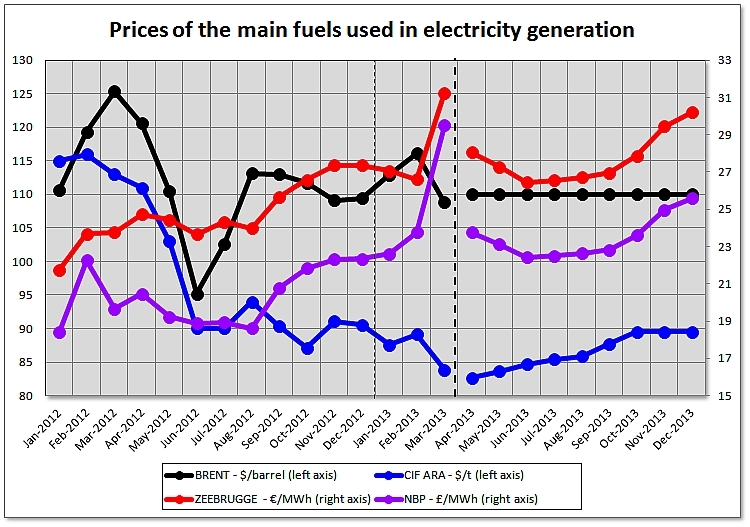 With regard to the prices of Zeebrugge and NBP gas, they are expected to drop in April down to 28.05 €/MWh and 23.77 £/MWh, respectively, and to subsequently return to the bullish trend at the end of the year, when Zeebruggegas will reach 30.19 €/MWh and NBP gas will reach 25.59 £/MWh. As far as the price of CIF-ARA carbon is concerned, it is expected to get back on the growth path, reaching 89.53 $/ton at the end of the year. 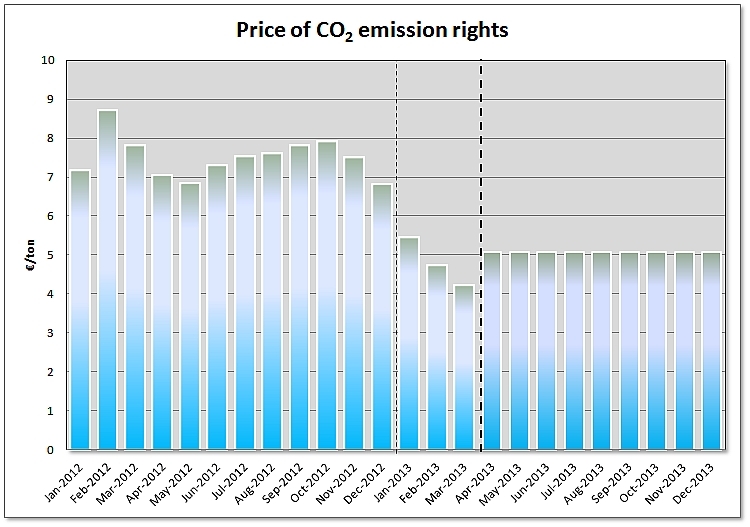 The average price of CO2 emission rights for the first quarter of 2013 has been 4.82 €/ton, which is 3.05 €/ton lower than in the same period of 2012. For the rest of 2013, the price is expected to remain stable around 5.08 €/ton.